Histio UK » What is Histiocytosis? Histiocytic Disorders and Rare Diseases – together we will find a cure! Histiocytosis is an umbrella term applied to a group of rare diseases, characterised by increased numbers of white blood cells called histiocytes in the blood and tissues. In all forms of histiocytosis, these cells, which are part of the protective immune system, begin to attack the body, targeting many organs of the body including the bone marrow, liver, spleen, lungs, skin, bone and brain. The prognosis for patients varies greatly depending on the form of histiocytosis. There are two main groups. The first group is called a dendritic cell disorder, and the most common disease in this group is Langerhans Cell Histiocytosis (LCH) previously known as Histiocytosis X. Also included in this group are more rare diseases, juvenile xanthogranuloma (JXG) and Erdheim-Chester Disease (ECD). Langerhans Cell Histiocytosis, LCH for short, histiocytes called Langerhans cells, which are normally found in the skin, may spread to many organs and damage them, so that the symptoms vary depending on which organs are affected, but skin rashes, destruction of bone, breathing problems and damage to the brain are common. LCH occurs in children, often during infancy but also in adults. It is usually a chronic disease and may cause severe disabilities due to brain damage. The diagnosis is made by microscopic examination of a tissue specimen obtained by biopsy. The prognosis depends very much on the extent of disease and organs affected, which can be assessed by imaging studies. 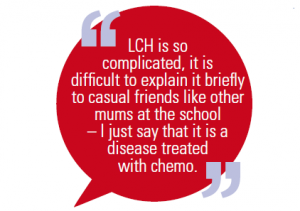 LCH is thought to be caused by alterations in the DNA of Langerhans cells. The second group is called a macrophage cell disorder, and includes primarily Haemophagocytic Lymphohistiocytosis (HLH) and Rosai-Dorfman Disease (RD). Haemophagocytic Lymphohistiocytosis HLH for short. In this disease a virus infection triggers another type of histiocyte, the macrophage, to become over active and attack the body. Red blood cells and other white blood cells are engulfed and destroyed by the macrophages, so that the patient is unable to fight infections. Patients therefore suffer from high fevers, may become anaemic and often have skin rashes, as well as symptoms due to the infecting virus. HLH is an acute and life threatening disease. It frequently occurs in childhood but may occur at any age. Diagnosis depends on detection of the infecting organism and demonstration of macrophages engulfing other cells as well as other abnormalities of white blood cells, usually in sample of bone marrow. In familial forms of HLH, abnormal genes, which alter white blood cell function, are passed from the parents to children. Rarer Forms - there are other even rarer forms of histocytosis related to both LCH and HLH and very rarely malignant histiocytosis occurs, which is a leukaemia-like disease of histiocytes. Histiocytosis UK online community provides a number of informational documents and articles, as well as links to medical articles about the histiocytic disorders. While the Internet does provide a significant volume of information about histiocytic disorders, some of this information is not accurate. It is important to look for documents that are current, are free of grammatical and spelling errors, appear to be objective, are free of advertisements, and clearly state their sources. Histiocytosis is a rare disease that is caused by the over-production of a type of white cell that can lead to organ damage and the formation of tumors. The Histiocytosis UK FAQ pages are also a great way to help explain these complicated diseases to family and friends. A rare disease is defined by the European Union as one that affects less than 5 in 10,000 of the general population. There are between 6,000 and 8,000 known rare diseases. Around five new rare diseases are described in medical literature each week. 1 in 17 people, or 7% of the population, will be affected by a rare disease at some point in their lives. This equates to approximately 3.5 million people in the UK and 30 million people across Europe. In the UK, a single rare disease may affect up to about 30,000 people. The vast majority of rare diseases will affect far fewer than this – some will affect only a handful, or even a single person in the whole of the UK. 80% of rare diseases have a genetic component. Often rare diseases are chronic and life-threatening. Rare diseases can be single gene, multifactorial, chromosomal or non-genetic. 75% of rare diseases affect children, and 30% of rare disease patients die before their fifth birthday. Rare Disease UK (RDUK) is the national alliance for people with rare diseases and all who support them. www.raredisease.org.uk. RATIONALE: Hemophagocytic lymphohistiocytosis (HLH) is a life-threatening hyperinflammatory syndrome that can be caused by bacterial infection. Streptococcus suis (S. suis) is a zoonotic pathogen that can cause severe disease in both pigs and humans. We report the first-ever documented case of HLH secondary to S. suis infection. PATIENT CONCERNS: A 12-year-old girl presented with fever, rash, hepatosplenomegaly, pancytopenia, and elevated levels of ferritin and soluble CD25. Bone marrow examination revealed hemophagocytosis. Blood culture was positive for S. suis. DIAGNOSIS: A diagnosis of hemophagocytic syndrome due to S. suis was established. INTERVENTIONS: We treated the patient with intravenous immunoglobulin, intravenous imipenem, and supportive care. OUTCOMES: The patient eventually showed complete recovery. LESSONS: Inflammatory response plays an important role in S. suis infection. Aberrant inflammatory response to S. suis infection may induce HLH. This case report illustrates that early definitive diagnosis and prompt treatment is a key imperative in patients with suspected S. suis infection. [Intracellularly Degradable Polyrotaxanes for Therapeutic Applications]. Recently, the application of β-cyclodextrins (β-CDs) as therapeutic agents has received considerable attention. β-CDs have been reported to have therapeutic effects on various diseases, such as Niemann-Pick type C (NPC) disease, a family of lysosomal storage disorders characterized by the lysosomal accumulation of cholesterol. To further improve the therapeutic efficacy of β-CDs, the use of β-CD-threaded polyrotaxanes (PRXs) has been proposed as a carrier of β-CDs for NPC disease. PRXs are supramolecular polymers composed of many CDs threaded onto a linear polymer chain and capped with bulky stopper molecules. In this review, the design of PRXs and their therapeutic applications are described. To achieve the intracellular release of threaded β-CDs from PRXs, stimuli-cleavable linkers are introduced in an axle polymer of PRXs. The stimuli-labile PRXs can dissociate into their constituent molecules by a cleavage reaction under specific stimuli, such as pH reduction in lysosomes. The release of the threaded β-CDs from acid-labile PRXs in acidic lysosomes leads to the formation of an inclusion complex with the cholesterol that has accumulated in NPC disease patient-derived fibroblasts, thus promoting the extracellular excretion of the excess cholesterol. Moreover, the administration of PRXs to a mouse model of NPC disease caused significant suppression of the tissue accumulation of cholesterol, resulting in a prolonged life span in the model mice. Additionally, the induction of autophagy by the methylated β-CD-threaded PRXs (Me-PRXs) is described. Accordingly, the stimuli-labile PRXs are expected to be effective carriers of CDs for therapeutic applications.